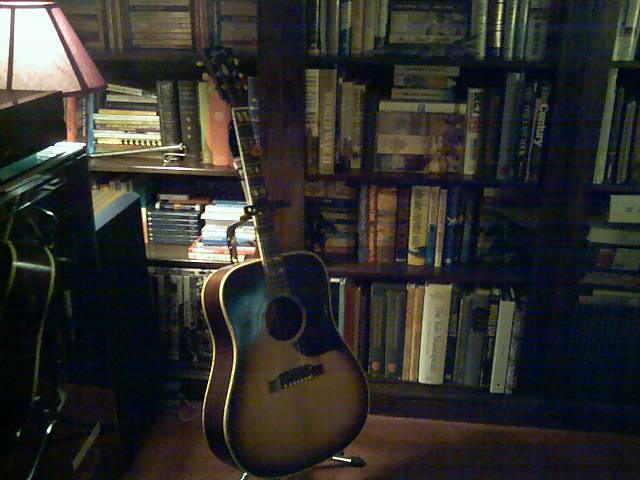 Above is a photo my beloved Gibson Dreadnaught that I posted in 2008. I bought it new in 1964, the year of its manufacture (One can tell by its serial number). I think I paid a couple hundred dollars for it back then, but I cannot remember the exact amount. I do remember that it cost me every penny I could scrape together at the time. In fact, I couldn’t afford a case when I bought it and carted it hither and yon for the next ten or fifteen years without a case. Even after I finally bought a case, I dragged it out of the case to play at some pretty wild soirees. A few times, I even left it to the tender mercies of airline luggage handlers as I toted it to a three blogmeets (very wild soirees, all). During all those years, amazingly, it only took a few dings. By 2005, I realized that I was exposing it to undue risk of harm by bringing it to blogmeets and certainly by letting any airline personnel touch it. With the expert help of the Late, Great Rob “Acidman” Smith, I bought an inexpensive, but serviceable guitar (a Washburn), resolving to forever leave my beloved Gibson Dreadnaught safe and sound in the House by the Parkway. A month or so ago, as it was resting in its stand as you see it above, a vacuum cleaning mishap resulted in a crack in the top of the instrument. It was an accident, pure and simple, but I still had to retire to another room for a few minutes to calm down. Fortunately, the crack didn’t affect the sound of the guitar, as it sounded as sweet as ever. But, between worrying that the crack would worsen and just having to look at my beloved Gibson in a wounded condition led me to conclude that I should have it repaired. I didn’t want just anyone to repair it, so I decided to take the necessary steps to return it to the experts at Gibson for the work. The process is a bit involved, including applying online to Gibson for a “repair authorization number” prior to sending them the guitar. It took a few days, but I got my number and a boatload of instructions for packing, shipping and ultimate payment. So, following Gibson’s instructions, I took it, in its case, to the UPS store to have it packed and shipped. The lady behind the counter asked me if I wanted to insure the package and, if so, for how much. Her eyes popped open when I answered that, yes, I wanted insurance, and, seeing as how one can’t buy insurance for something that’s “priceless,” I wanted it in the amount of $3,000.00. That’s the price of a comparable Gibson Dreadnaught today. So, between the packing, shipping and the insurance, I paid UPS $123.00. (You pay extra for the extra careful handling and delivery signature requirements for items that are insured for more than $1,000.00.) Add to that the $75.00 “evaluation fee” Gibson charges in order to plan a repair and generate a quote, and we’re already tickling the amount that I paid for the guitar. I expect the entire process will take weeks (Just getting the evaluation and quote can take five weeks) and will cost quite a bit, but I’m ready to pay it. I figure that after all the pleasure my beloved Gibson Dreadnaught has afforded me these past 46 years, it’s the least I can do. The tough part was handing it over to the UPS lady and leaving the store empty handed. It was sort of like dropping your kid off for her first day at college.